…somewhat akin to a certain Jeff G., which, because of the NUANCE! I continue to find it amazingly amazing that the political party of which continually bills itself as the party of The People! (which, if you were wondering, is the Democrats) has taken such a ready and almost, dare I say, “pitbull”-like (minus the lipstick, of course) approach to painting a certain Sarah Palin as a backwater hick, as a floozy, cheerleader, woman-hater, etc. Apparently, one of Sarah Palin’s biggest failings is that she hasn’t been part of the mainstream political elite for long enough. Cuz, you know, we want CHANGE! We don’t want business as usual. We want to mix it up with a fresh face, a relative unknown, someone from outside who can come in and shake up the way things are run. No more business as usual. You know, unless of course, you happen to be a Republican woman who, quite unfortunately, opposes the sacrosanct abortion at all cost and in all cases. Because we are the party of the people, the lowly joe. Unless of course, you decide to run against a Democrat. The debate is all but over now. Well, so far intellectual powerhouses and insightful political analysts like PINK, Pamela Anderson, Matt Damon, and now Lindsay Lohan have all come out firmly against Sarah Palin. I figure its only a matter of time before Drew Barrymore and Cameron Diaz weigh in. I mean, really, what more do you need? It looks like it’s Barak Obama for me! As seen/discovered in the comments for this post over at Michelle Malkin, I heartily jump on the bandwagon. From now on, the Strunk & Whites’ official textual accuracy for liberals is now: LIEberals. Please update your spellcheck. Thank you. 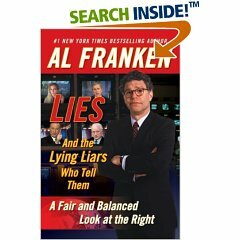 I have to wonder what Al Franken, the seasoned, responsible journalist that he is, thinks of all this media make-believe?